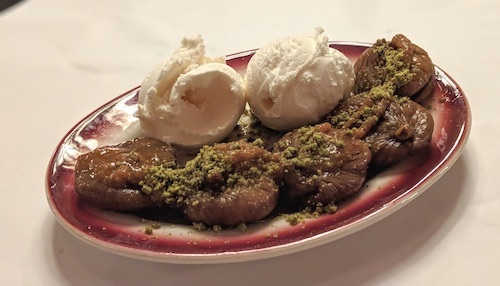 "Beyti" is a reference to a famous chef and restaurant in Istanbul that opened in 1945, a place presidents and royalty (and you) go for kebabs, and eventually the name of a unique kebab named after the man's creation. 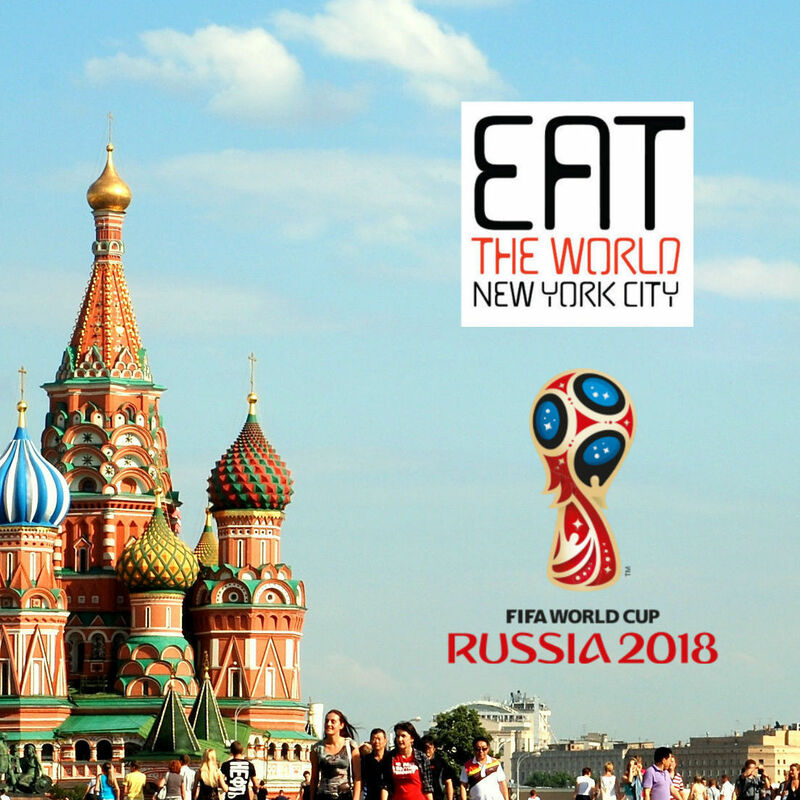 Here deep in Brooklyn it has inspired one of the city's best Turkish restaurants. The bright, long dining room is in two parts, with big groups eating together and bringing many bottles of their own alcohol with them. I counted three empty bottles of vodka or something similar, and a fourth being worked on at a ten person table. Heavy drinking was obviously a big part of these feasts. But couples come here too, and everything in between. The restaurant can really accommodate anything you bring their way. 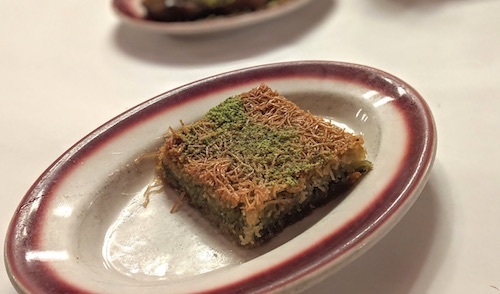 I like eating small plates at Turkish restaurants, and it is a good way to get a lot on the table without ordering way too much if you are just dining as two. The pan-fried eggplant ($8.50, below) is a good start, and must be cooked in an array of peppers as it comes to tingle your tongue. It is served with yogurt, which is the perfect compliment to rich and sometimes spicy food. 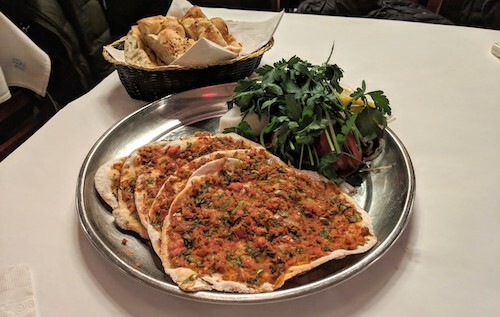 Make sure to get a small bowl of cacık ($8.25, below) on your table. It is an absolutely delicious mixture of yogurt, cucumber, mint, garlic, and ample portions of dill. It's similar to tzatziki, but for me is always better in Turkish restaurants. You can use it for the bread they provide with your meal, or put it on other dishes, as it goes well with vegetables and meat alike. 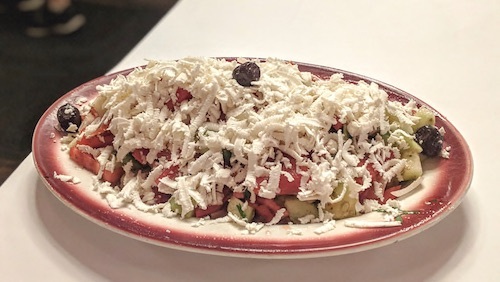 To keep your meal from being completely gluttonous, order a large shepherd salad with cheese ($15.50, below). It is very simple in its satisfaction, a combination of cucumbers, tomatoes, onions, green peppers, and covered in olive oil and lemon juice. The fresh and crisp quality of the plate is surprising, especially when combined with the thin melt-in-your-mouth feta. 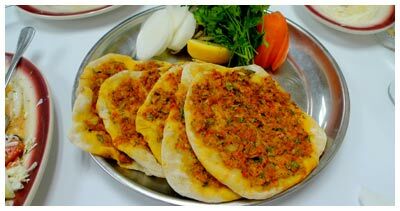 The findik lahmacun ($15.75, below) is another winner, a Turkish-style pizza with very thin crust. The saucers are topped with ground lamb, tomatoes, and spices, but has mild, subtle flavors. 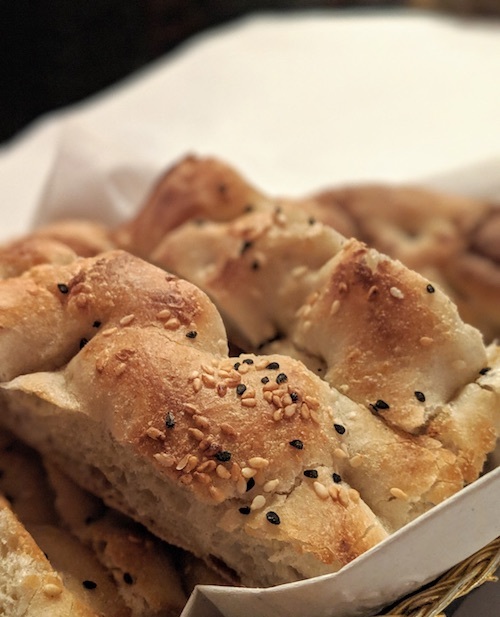 The crust remains slightly crispy (eat it before it sits too long), and it combines very well with plain yogurt and/or cacık. 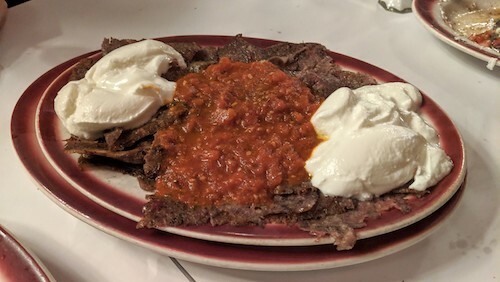 When in a restaurant named after the Beyti, it was an easy choice to pick the Beyti kebab ($21.25, below) for an entree. 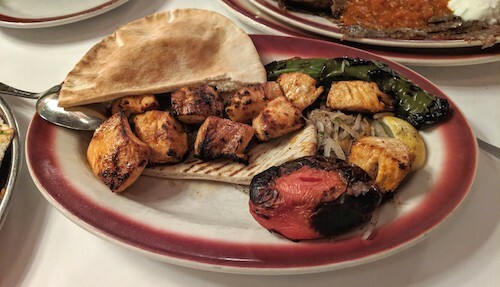 This kebab is lamb infused with hot peppers and garlic, and comes with pita bread, a cooked half-tomato, and a heap of onions. It's a fine two pieces of meat, perfectly cooked for maximum juiciness. 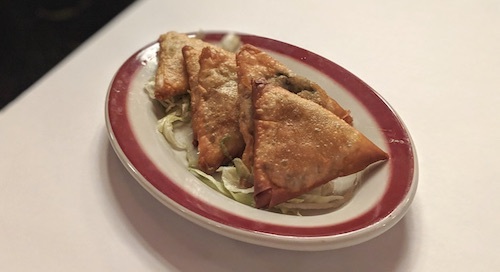 Bring a big crew so that you can sample many items from the extensive menu, including fresh pides cooked in their oven. 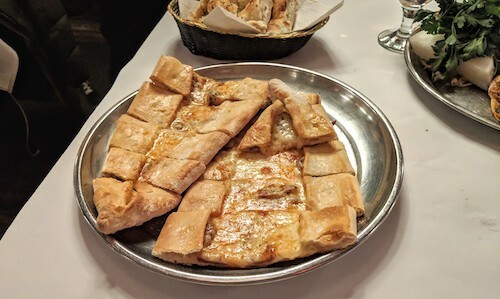 Turkish bread shows up to every table. 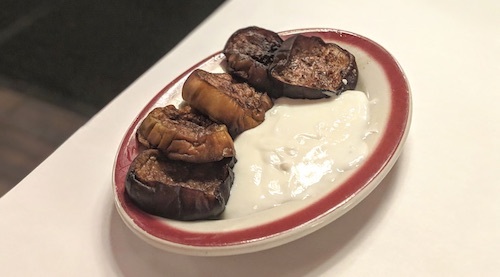 If you make it to the desserts, make sure to get the incir tatlisi ($8.25, below) when available, figs stuffed with walnuts with a drizzle of pistacchio, served with two scoops of vanilla ice cream.